The Red Rock Canyon NCA provides scenic and recreational opportunities for hundreds of people each day. Modern visitors are drawn to the Red Rock Canyon NCA for the recreational change of pace and beautiful scenery it has to offer. But, the area has been utilized to meet man's needs for thousand of years. It is an area rich in cultural resources. Cultural resources are anything that man has used, made or altered. These resources tell a story of prehistoric Americans in a desert land. 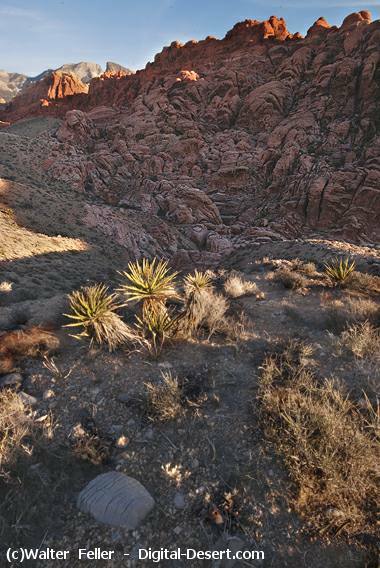 Over the thousands of years of human activity, in southern Nevada, as many as six different Native American cultures may have used the Red Rock Canyon NCA. The key to the areas prehistory is water. In the desert areas surrounding Red Rock Canyon NCA and the Spring Mountains water is scarce. However, the Red Rock Canyon NCA contains over 40 springs, as well as many natural catchment basins (known as tanks or tinajas). With the presence of dependable water, plant and animal life is richer and more concentrated than in the surrounding desert. The abundance of plant and animal food sources made the Red Rock Canyon NCA very attractive to hunters and gatherers such as the historical Southern Paiute and the much older Archaic, or Desert Culture Native Americans. These peoples traveled in small mobile groups that ranged over large areas of land following the ripening of various plant foods. Red Rock Canyon NCA was an important stop on their seasonal round. Even the more settled agricultural groups such as the Patayan Culture, from the banks of the upper and lower Colorado River near Hoover Dam, and the Anasazi either traded or traveled to Red Rock Canyon NCA for its resources. Red Rock Canyon NCA is considerably higher in elevation than the river valley homelands of these two groups. Because of the increased elevation, Red Rock Canyon NCA has several higher altitude plant and animal types that would have been unavailable at the lower elevations. HOW DO WE OBTAIN KNOWLEDGE OF EARLY NATIVE AMERICANS? Since the Southern Paiutes were still in the area when the first non-Indians (Europeans) entered southern Nevada, we have some written records of their presence and lifestyle here. For the most part, however, all of our knowledge of ancient Native Americans comes from the cultural resources they left behind. For example, we know that the Anasazi Indians either visited the Red Rock Canyon NCA or traded with its residents because we have found pieces of broken pottery that can be identified as their type of ceramics. Some pieces of pottery not only tell us who was in the area, but when they, were there. Pottery decoration styles, clay color and manufacturing techniques change with periods of time and vary from group to group. Even projectile points (arrowheads) can serve as time markers to archaeologists familiar with the prehistory of the area. Since these resources are our only source of information on American's prehistory, it is important to, preserve and protect them in their original location. But, cultural resources are more than storehouses of information. They can also be part of a very important and personal experience of Red Rock Canyon NCA. Seeing a projectile point where it was dropped or shot hundreds or even thousands of years ago can provide the basis for a meaningful experience linking you with a person who walked or hunted here long ago. If you choose to remove the point from its place, not only have you broken the law and caused the loss of potential scientific knowledge, you have denied others a similar experience. Any artifact loses almost all of its value when it is removed from its original location. We have the responsibility to preserve and protect these resources. Roasting pits are perhaps the most common cultural resource found in Red Rock Canyon NCA. Roasting pits are circular areas of fire-cracked and whitened limestone. They can vary in size from ground level circles five to six feet in diameter, to huge piles several yards high with large sloping sides. Roasting pits were used to roast various foods such as agave hearts, desert tortoise and possibly other plant and animal foods. The limestone was gathered, heated by the fire and then used to cook the foods. After prolonged heating, the limestone was raked aside and replaced with new rocks. This process caused the circular ring of rocks to grow with use. There are several roasting pits at the Willow Spring picnic area, including one of the largest, in southern Nevada. The large pit is located at the base of the sandstone cliffs just behind and downhill from the restrooms. Rock art comes in two varieties, petroglyphs and pictographs. The difference between the two types is the manner in which they were made. Petroglyphs were pecked into the surface of the rock. Pictographs were painted on the rock. In Red Rock Canyon NCA a coating of dark "desert varnish" on lighter sandstone provides the perfect medium for petroglyphs, which are the most common of the two types of rock art found at Red Rock Canyon NCA. If you want to discover some petroglyphs firsthand, the Red Spring area has a wide variety of different styles on the cliff face's and fallen boulders. Rock art is both enduring and fragile. It has lasted hundreds of years, yet many panels have been recently defaced by graffiti. Climbing on panels can also damage the art, as can attempts to embellish the petroglyphs for photographic purposes. These practices, are destructive and should not be done. In the places where Native Americans who visited Red Rock Canyon NCA camped and lived, they left behind the tools and trash of everyday living. Broken pots and stone tools are pieces of the puzzle that, when put together, tell the story of ancient ways of life and human adaptation to the desert. If you see these cultural resources, enjoy them, but please leave them to tell their story and to be appreciated by others. Pinto/Gypsum ( Archaic) 3,500 B.C. to 1A.D. The above dates are approximate and subject to considerable debate. Some are likely to be modified as our understanding of this region's prehistory increases. These dates are based on a number of techniques and methods including references in early historic writings, radiocarbon dates, ceramic (pottery) cross dating and comparisons with surrounding areas that have more established chronologies. Two other groups were present in southern Nevada and probably utilized the Red Rock Canyon NCA, although no evidence of their presence has yet been found.